At a special event in South Korea, LG officially launched the most powerful Android phone do date, the Optimus G.
Built around a 4.7-inch True HD IPS Plus display with a resolution of 1280 x 768 (15:9 ratio), the Optimus G is powered by a Snapdragon S4 Pro chipset, featuring a 1.5GHz quad-core Krait processor and the whopping 2GB of RAM. Naturally, this powerhouse boasts LTE connectivity as well as NFC, Bluetooth 4.0, and Wi-Fi with DLNA. At the back there's gonna be either 13MP or 8MP snapper, both teamed up with a LED flash and capable of shooting 1080p video. Below the back cover resides a 2,100 mAh battery rated for 15h of talk time and 335hours of standby. Measuring 131.9 x 68.9 x 8.45mm, the Optimus G weighs 145 grams which is pretty good for a smartphone with such large screen and powerful internals. Internal storage is 32GB. The LG Optimus G runs on Android 4.0 Ice Cream Sandwich, with LG's proprietary Optimus UI launcher on top. However, an update to Jelly Bean is scheduled to follow in the not so distant future. Speaking of the customization LG has put on the Optimus G, it has quite a few outstanding features. One of the most useful is called QSlide Function and it allows you to overlay two screens with different apps running on each one. You can even set the opacity level of the two screens. Some of the other interesting ones are Application Link, which launches a pre-defined app once you turn off the alarm and Cheese Shutter for taking pictures with voice commands. 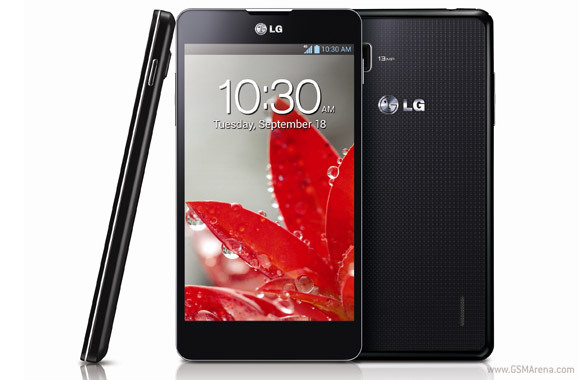 The LG Optimus G will be priced at 1,000,000 Won ($896; €683) in Korea. The device goes on sale in its homeland starting next week. Global availability will follow soon afterwards. Update: We are live from the LG Optimus G launch event in Seoul, where we've managed to spend some one on one time with the Android beast. Design wise, the LG Optimus G looks strictly utilitarian - there is practically nothing to distract you away from the gorgeous True HD IPS Plus display and all the software trickery. Build quality is solid. The handset appears ready to take plenty of abuse. The front and the back of the LG Optimus G are covered in glass. The sides of the handset are made of plastic, which has been manufactured through a process using a six-axis laser for extremely high quality and durability. As you already know from the press release, the Optimus G will come with 8 or 13MP main camera, depending on the market. The handset in our live photos sports the higher pixel count and noticeably sticks out of the body. We've learned that the 8MP camera will sit completely flat. We've got an update on the LG Optimus G global availability. It will arrive in Japan in October and in the United States in November. Here go some live shots of the white LG Optimus G. It is definitely more of an attention grabber compared to its black sibling. Regions with LTE coverage will have priority when the rollout of the LG Optimus G begins. The handset will get updated to Android 4.1 Jelly Bean in Korea by the end of this year.